Mobile Pentium® 4 CPU processing power, Apple® Powerbook® style and Panasonic® ToughBook® durability.Durable than any other notebook computers in its class, the N1400 boasts a military-compliant magnesium casing that protects the screen from just about any damage. In addition, its hard drive is safeguarded with a foam rubber padding that meets the MIL-STD-810E vibration and drop specifications. With its unique keyboard design, N1400 will be continue running even if you accidentally spill your cup of coffee all over thekeyboard. Stylish in shape and color, N1400’s ergonomic designs include placing all of its ports toward the front of the system for easy access. The lid can be opened with one finger, freeing one of your hands for other tasks when you are on the go. "Alright, so it’s durable, but can the Twinhead N1400 serve as your only PC? You bet. 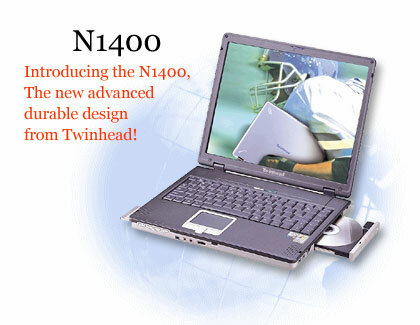 Since N1400 is designed as a go-anywhere laptop instead of as a desktop replacement, the used of integrated video and audio in the VIA P4N266…; reduced the overall power consumption of the system compared to discrete audio and video chips." "Overall, we found that N1400’s input system to be excellent. The keyboard offers a comfortable feel…"
power at a cost effective price, consider the N7600 from Twinhead. Copyright@1996-2002 Decade Computers. All rights reserved.